Put on your vintage gladrags and show us your fancy footwork with The Loveboat Big Band, Scotland’s premier swing sensation. 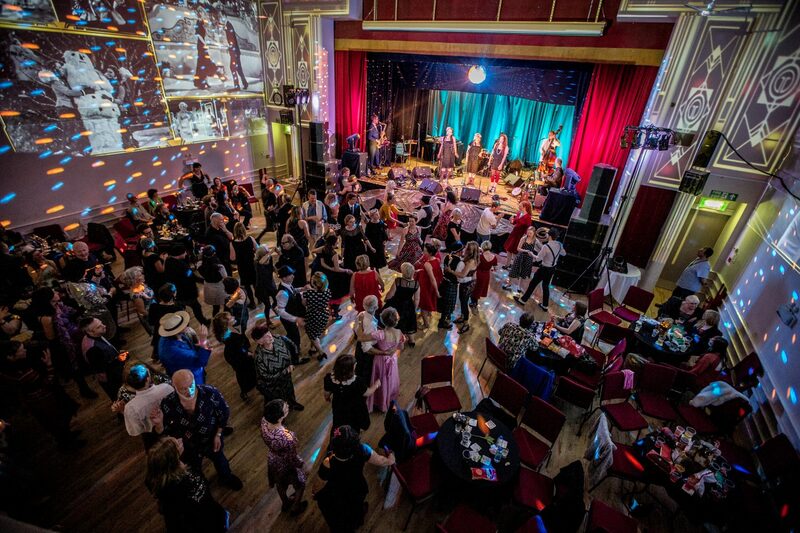 The stage will be bursting with 16 first-class musicians, who will have you swinging and grooving your way through the decades as they serve their uniquely intoxicating cocktail of vintage swing numbers and cheekily revamped pop classics. Step out on to the dance floor in your fancy threads as we invite you to Glitter and Sparkle – no holds barred! We’re also treating you to dashes of cabaret throughout the evening. Hosted by the witty Steve Cousins (Let’s Circus) our deluxe twist of cabaret includes Ruse and his mind-bending magic cups and uber-hula-hooper Toni Smith. And if that’s not enough DJ Monkey Magic will keep you glittering and sparkling on the dance floor all night long with electro-swing music infused with classic sounds from the 30s to the 60s. Cabaret Seating | Bar Service by The Red Lion | Over 18s only. The Loveboat crew are a long-time and much-loved Edinburgh institution. A firmly established crowd-puller, with crowds delighting in dressing up, to match the shows’ vintage-style glamour and sophistication.